The E-PROPS propellers are fully made in France (South-East, Provence, near the city of Sisteron). The team of 28 aeronautical engineers and technicians is producing more than 30.000 carbon blades per year. The ultra-modern workshops are equipped with 12 CNC machining centres. E-PROPS parts are designed and manufactured to be very light and very strong at the same time. Materials and manufacturing process are validated by many tests and are following a strict quality system. 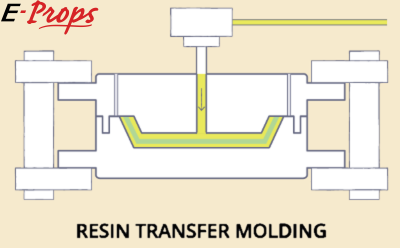 All E-PROPS parts, blades, hubs and spinners, are made with manufacturing process called RTM (Resin Transfer Molding). This process is used by major companies as AIRBUS and BOEING for some critical ultra-light carbon parts on liner aircraft. RTM is one of the best methods for mass production of composite parts. It is primarily used to mold components with large surface areas, complex shapes and smooth finishes. RTM process is realized by following a strict cycle of temperatures. The cooking of carbon parts allows to improve certain properties, in particular mechanical and of resistance under very hot conditions. To assure a strict quality control and the reproducibility of the production, the components are exactly weighed very throughout the manufacturing. 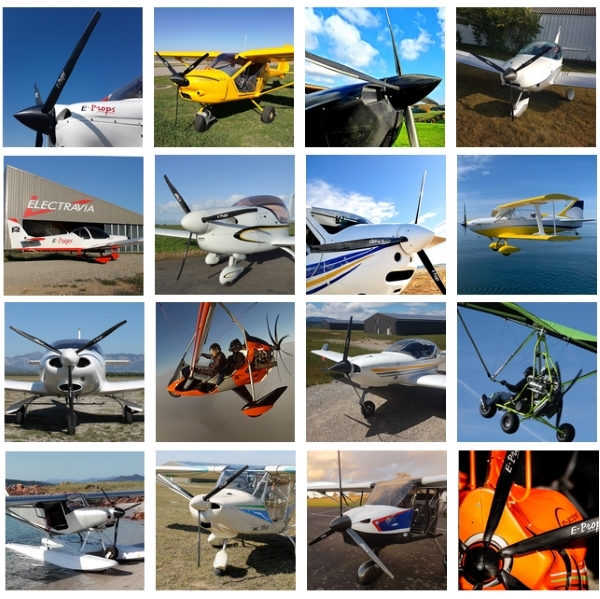 For example, 15 weighings are necessary for a propeller range Ultralights / Aircraft. A 8-axis machining centre has been built by the E-PROPS team to allow the dimensional analysis, the rectification and the finish of the carbon parts automatically, without dismantling of the part. It is equipped with a directional spindle programmed according to the digital definition of the part, with a wide tool store. The precision of measure by the scanner laser is of 5/100th of millimeter. The scanner sweeps the carbon part, the program recognizes it according to its database, then the different tools come to make all the finishing work: deburring, cut, drilling, sanding and polishing. All the stages between the molds and the stock are automatic. Carbon parts built with the RTM process then finished with a precise CNC centre, as E-PROPS propellers, are far superior to conventional "half-shell" fiberglass parts in terms of structural properties, quality, lightness and aesthetics. All E-PROPS blades are made in CARBON BRAID + EPOXY RESIN. - CARBON BRAID, HCF process. Carbon has an excellent compromise of rigidity/weight. The use of a single material (carbon) is far better than the use of two materials, such as a mixture of fibreglass and carbon (often used to save carbon which is much more expensive than fibreglass). Propellers with a single base material have a much higher potential (manufacturer recommended duration of use). The HCF process (Helical Continuous Fibers), specifically designed by E-PROPS, ensures an exceptional strength of the 100% carbon + epoxy resin blade, from leading edge to trailing edge, from blade's foot to tip. To the contrary of the usual process called "half-shell", used by most of the manufacturers of composite propellers, the carbon fibers are continuous between the top and bottom surfaces. The braid is made like a sock. The mechanical strength is increased and becomes very high : no risk of rupture by delamination of the leading edge, no craks on the blades or on the hub. To make very strong carbon parts, the most important is to have the maximum of fibers and the minimum of resin; it means a high fibers ratio. Fibers is 50 times more resistant than resin. Parts made by E-PROPS have a very high carbon fiber ratio : 63% (which is exceptional). For example, a 2 glued half-shell blade has a fiberglass fiber ratio of about 30%. The epoxy resin used by E-PROPS is including a high resistance to UV additive (UVA and UVB). 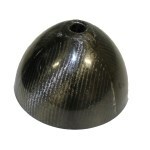 The E-PROPS hubs are made in CARBON FABRIC + EPOXY RESIN. Carbon fiber fabric has several advantages including high stiffness, high tensile strength, low weight, high chemical resistance, high temperature tolerance and low thermal expansion. E-PROPS is only using carbon fabric produced by major companies working for aerospace industry : their materials are more expensive, but the quality is far better, with a good traceability. 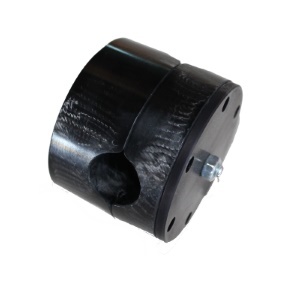 The RTM manufacturing process is also used for the hubs. Those parts are extremely strong and very light. 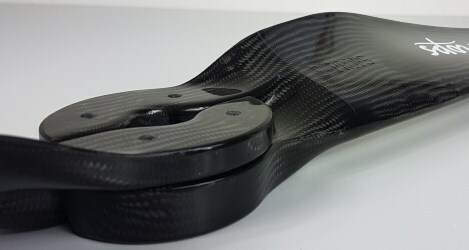 Fully made in carbon braid, as an extension of the blade, reinforced with more carbon layers. Two sectionnable parts, very simple to assembly. Thickness of the blade's foot : 28 mm for classic range / 38 mm for Scimitar range. The E-PROPS spinners are made in CARBON FABRIC + EPOXY RESIN. The RTM manufacturing process (RTM) is used for the spinners. Those spinners are very light. The flange is screwed in the middle of the spinner : this position allows to reinforce the light spinner. - Spinners are polished for a very good finition. No paint, no varnish. => See page ENVIRONMENTAL RESPONSIBILITY. The customer may paint his spinner, if desired.